Rocket science has no place in my kitchen. As much as I love to cook, I sometimes run across certain tutorials/techniques that make my no-fuss brain want to explode. 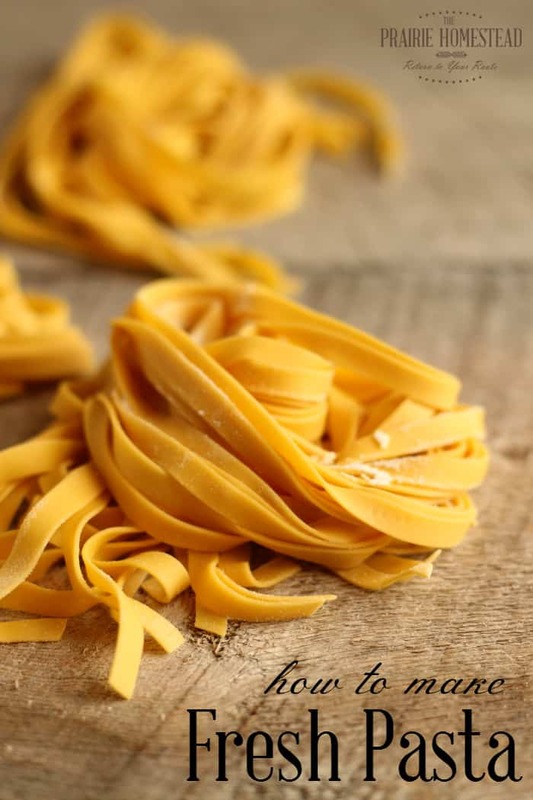 Take fresh pasta for example. 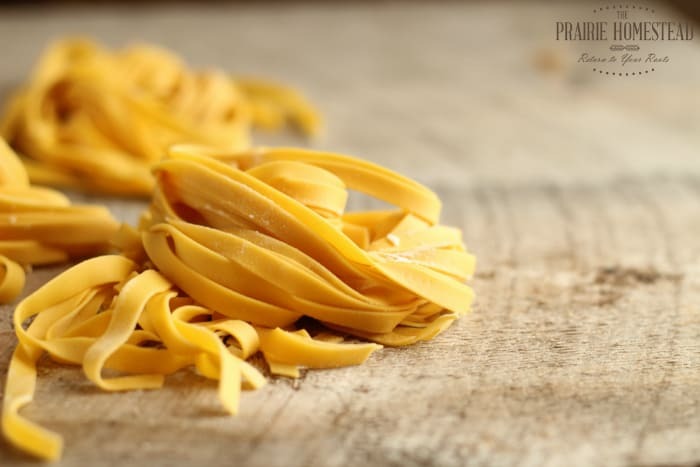 Many of the “basic” fresh pasta recipes you find floating around Google make homemade pasta seem all but attainable with their complicated formulas, detailed instructions, and mind-numbing array of ingredient options. It’s entirely possible to make very delicious, perfectly textured, from-scratch pasta without the fuss. And only three ingredients. You’re welcome. If the dough is too dry and won’t stick together, add a 1/2 teaspoon of water. If it is too sticky, sprinkle in a bit more flour. Keep in mind this dough will be much stiffer than traditional bread dough. However, the longer you work it, the smoother and more pliable it will become. You’re looking for a smooth texture. 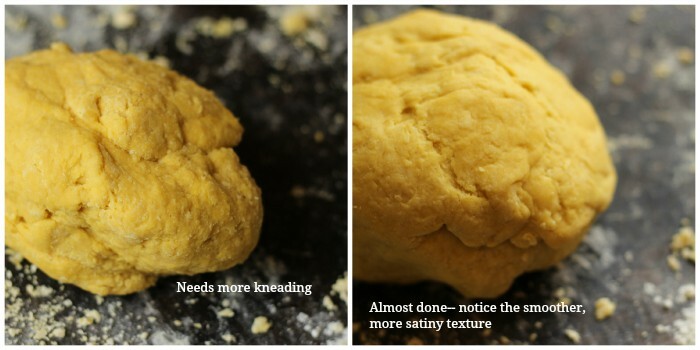 If your dough is still rough, keep kneading. We are looking for a smooth, satiny consistency, which will develop the longer you knead. After the resting period, divide the dough into four portions and roll into a small, flat circle. Now comes the cool part! I’m really picky with my kitchen gadgets, and generally only keep the necessities. However, I’m very loyal to my pasta machine (affiliate link) and it has earned its place in my crowded cupboards. 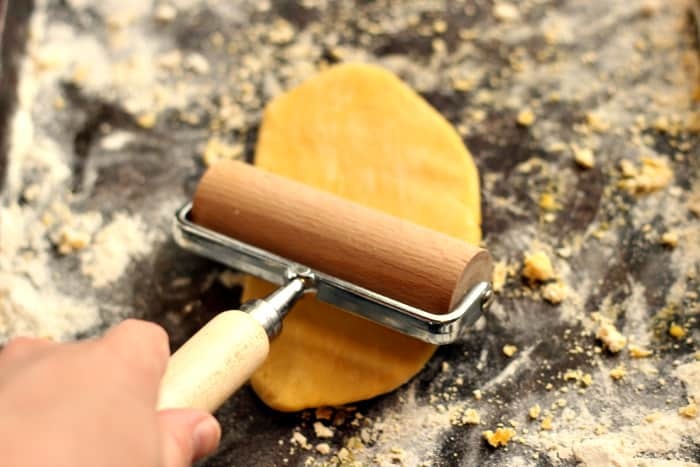 Rolling the dough is a process– you need to make several passes, throughout each thickness setting for the best results. 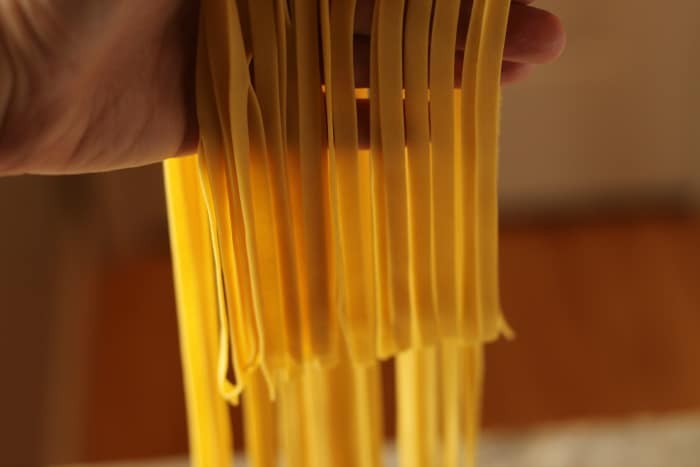 I start with the biggest setting (usually 5 or 6), run it through once or twice there, then gradually adjust the settings to be thinner and thinner until I have the perfect sheet of golden pasta. Between each pass, I fold the strip into thirds. This helps square up the edges and keeps things even. Then simply roll it through the cutting side of the machine to slice into spaghetti or fettuccine. 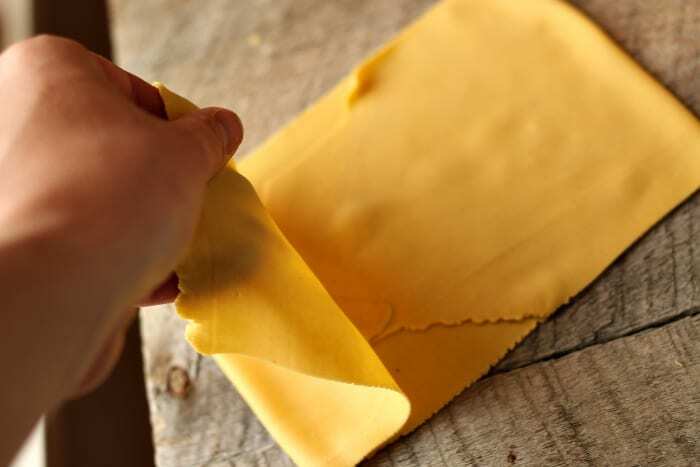 If you don’t have a pasta machine, you can use a rolling pin and knife (or pizza cutter) instead. Keep in mind you’ll want to roll it out as thin as humanly possible, as it will plump up considerably once you cook it. From here, you can either cook your pasta right away (3-4 minutes in boiling water) or dry it for later. 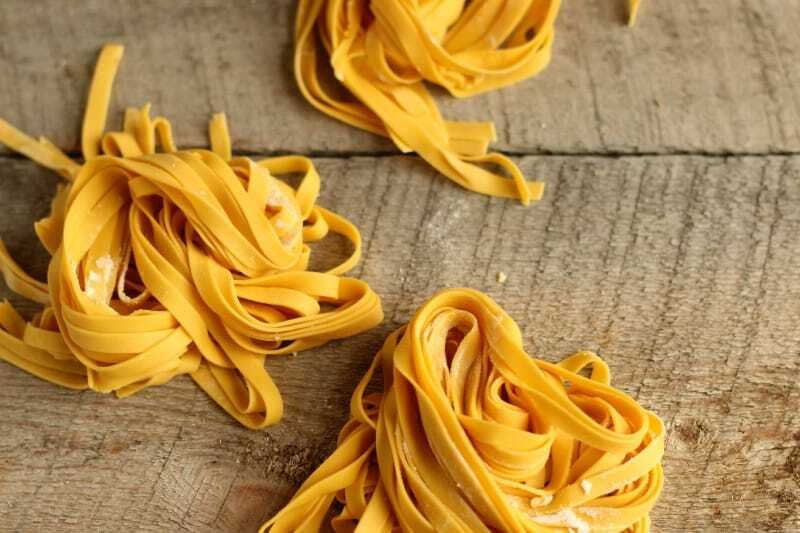 Serve your perfect homemade pasta with homemade sauce, or olive oil, Parmesan, and fresh herbs. 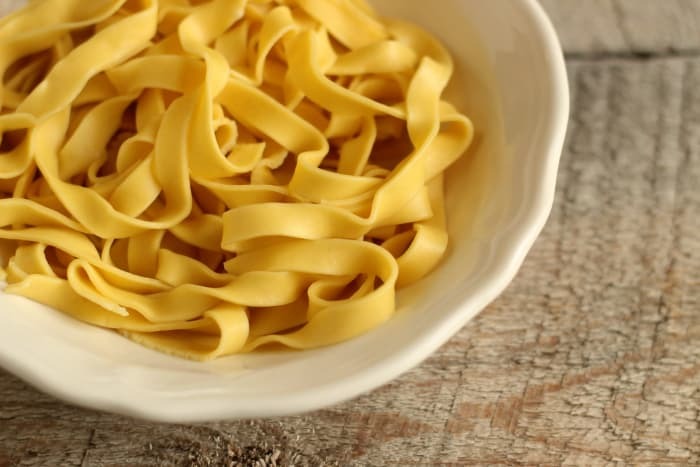 There are a variety of opinions when it comes to flour for making homemade pasta, and some people get all fancy with specialty flours (traditionally, pasta is made with semolina flour). However, I’ve had wonderful results just using regular unbleached all-purpose flour. If you like, you can use a mix of whole wheat flour, combined with the all-purpose. Keep in mind the more whole wheat you use, the more the consistency of the finished noodles will change. 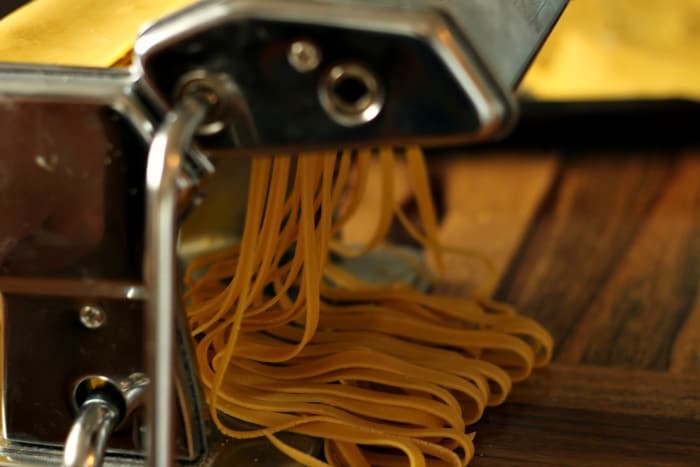 If at any point, your fresh pasta is wanting to stick to the surface, the machine, your rolling pin, or other pieces of pasta, add more flour. I’m usually very generous with my flour-sprinkling. Otherwise, you’ll end up with a sticky blob. I’ve not tried this recipe with gluten-free flours, sorry! You can easily make flavored fresh pastas by adding fresh or dried herbs to the dough, or spice it up with garlic or onion powder. There are a variety of opinions when it comes to pasta flour… Some people get all fancy with specialty flours (traditionally, pasta is made with semolina flour). However, I’ve had wonderful results just using regular unbleached all-purpose flour. If you like you can use a mix of whole wheat flour, combined with the all-purpose. Just keep in mind the more whole wheat you use, the more the consistency of the finished noodles will change. You can easily make flavored pastas by adding fresh or dried herbs to the dough, or spice it up with garlic or onion powder. My mom had a noodle-making business when I was growing up. Gotta say, it’s a lot of work to fill a kitchen and dining room with 100 sq ft of noodles, but I knew how to make dough by the time I was 8. It definitely tastes better than bagged noodles in the store! PS – you haven’t had fun until you’ve cracked 4 dozen eggs into a bowl! I have done that with simply scrambled eggs FOR OUR FAMILY ONLY! When you’re drying the pasta noodles…you just…lay them out until they’re hard? I spread mine out on a big flour sack towel. I think the towel helps absorb some moisture, helping the noodles dry out faster. It also makes it easier to “stir” the noodles & allow for complete drying. I just lift one edge of the towel to sort of fold them into the center and redistribute them. Yep– or you can hand them on a hanger, too. Whatever works! That works for me! I always just let them rest on the counter on a cookie sheet until I’m ready to boil them – If I sprinkle some flour on them I don’t have to lay them out flat I just leave them in a pile- homemade pasta is delicious. I always use fresh milled soft wheat flour and the noodles turn out great. ?? I dry mine in the microwave right after I cut them. They are ready for the pot of chicken bone broth immediately! Perfect every time! This looks so great, I’ve always wanted to make my own pasta! Love the yellow color from the farm fresh eggs! Maybe your brain is fermented. Farm fresh eggs do not provide any more or less color than any other egg! And you are promoting a cooking website? What kind of fool would visit a website run by someone so obviously inept!? I’m afraid I have to respectfully disagree – not only with the content but with the tone of Sir Cranky-a-lot’s reponse. The egg yolk (“il rosso” in Italian, or “the red”) is a brighter yellow, often closer to orange in farm fresh/free-range eggs. Whether it is their diet or the processing of large scale poultry operations that results in lighter egg yolks, there is a difference that Colleen correctly points out. 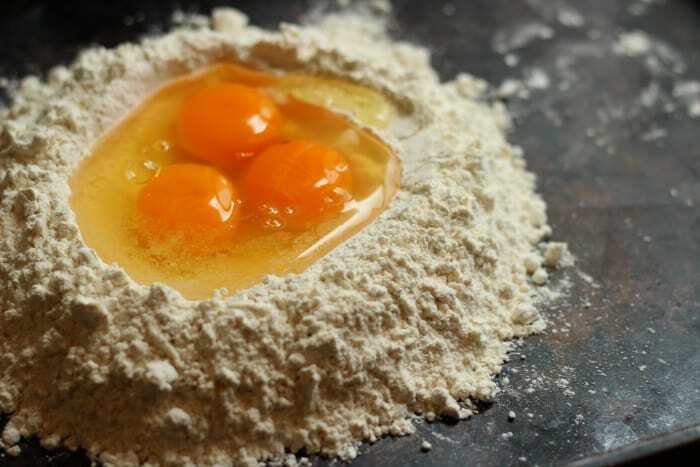 If the eggs have darker yolks, then the resulting pasta will be more yellow. I grew up on a farm with chickens and lived in Italy for 5 years where I learned to make pasta, so I write from personal experience and not from any fermentation of the brain – thank you very much! I agree Mr. David. Farm fresh eggs ARE different from industrial eggs. Just google it! I have backyard chickens and can confirm, our yolks are much closer to orange than any egg you get from the store. Yes, I agree. Backyard chicken eggs are bright orange. Nothing like what you get in the store. And they are also more delicious. I can speak to our farm fresh eggs being different than that of a typical commercial egg. The colour of the yolk changes through the year, becoming more orange than yellow depending on how much green plant they have in their diets. The firmness of the egg also changes, typically with firmer egg whites when the hens have more access to insect proteins. So true! Obviously that idiot has never had farm fresh eggs! Its amazing how given a little anonymity people become so rude. I too would like to confirm that farm fresh eggs absolutely have a different colour and texture to that of the big production house eggs. Especially if they are free range foragers. They DO give a different colour to a dish. I make my own bread and pasta using organic kamut wheat and we raise our own chickens for eggs. Big difference in the outcome between using store bought mass produced eggs and our yard eggs. I really recommend trying kamut if you haven’t already. Its delicious and much healthier than modern wheat. I have eggs from the store in my refrigerator and some that are fresh from 8 hens that I take care of when their people are out of town. I can confirm the yolks are darker orange than the pale yellow orange you see from the store. Fresh eggs are higher in nutrients than conventional eggs. There is also scientific evidence that hens fed soy feed have soy proteins in the yolk so for people with intolerance to soy should avoid eggs fed this way. Sir you have never had the eggs we raise on our farm. They are much brighter and taste incredible. People pay us $5 dz for them. There is a huge difference then factory eggs!! I love homemade pasta. Thanks for a great tutorial! When I had more chickens producing WAY more eggs than I could sanely use, I made angel food cakes to sell at the local farmer’s market. What to do with all those leftover yolks? Make noodles, of course! 🙂 You have to add water to make up for the missing whites, obviously. My recipe was 4 egg yolks, 1/4 c. cold water, 1 1/2 c. flour and 3/4 t. salt. Instructions are the same as the above recipe. Grandparents and their recipes…what a blessing :). I haven’t tried making the pasta yet, but will try both with the whole eggs, and with yolks and water. Thanks for the great ideas! I agree. The above recipe was a total flop. It needs moisture. I could not really see a response from someone who MADE it as posted after casually scrolling . Pet peeve ! “Looks yummy!” helps no one . Honest feedback : this recipe does not work , particularly if do not live in a very humid environment. Add oil and water. I did make this tonight and I live on the east coast. You’re right- definitely too much flour- I only needed a cup and a half, plus 1 tablespoon of water and I added just a little oil on the counter to knead it in. Turned out perfect but the above recipe was far too dry for the east coaster i am! I make gluten free pasta using home milled rice flour salt & eggs plus a touch of xanthan gum. Tastes way better than bought. Ive been searching for G.F. homemade noodles and not having luck. I made some with Buckwheat flour but they were to dry and just crumbled. I kept adding egg and water trying to get it the normal soft dough and never achieved it. I got it enough to roll out but would never make it thru the machine. I didn’t add xanthum gum so maybe that is the difference?? I will try them with the rice flour too. Thank you. I dry my homemade pasta noodles on an old sheet that’s draped across the bed in the spare bedroom to dry. That’s how my grandmother and my hushband’s grandmother dried their noodles. Once the noodles are dried I package them in ziplock freezer bags and store them in my chest freezer in the basement. Happy pasta making everyone! 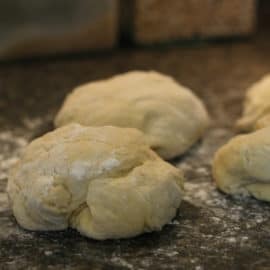 One of my earliest memories is sneaking into the bedroom (where my grandmother had her dough laid out to dry before cutting) and pulling off little pieces and eating them. She made the best chicken and noodles. I can’t wait to try this, I don’t have a pasta maker but I can make do! Jill all of your recipes are great. I just made the pumpkin bread, and the chocolate zuchinni bread recipes Monday, and the pizza crust recipe last week. 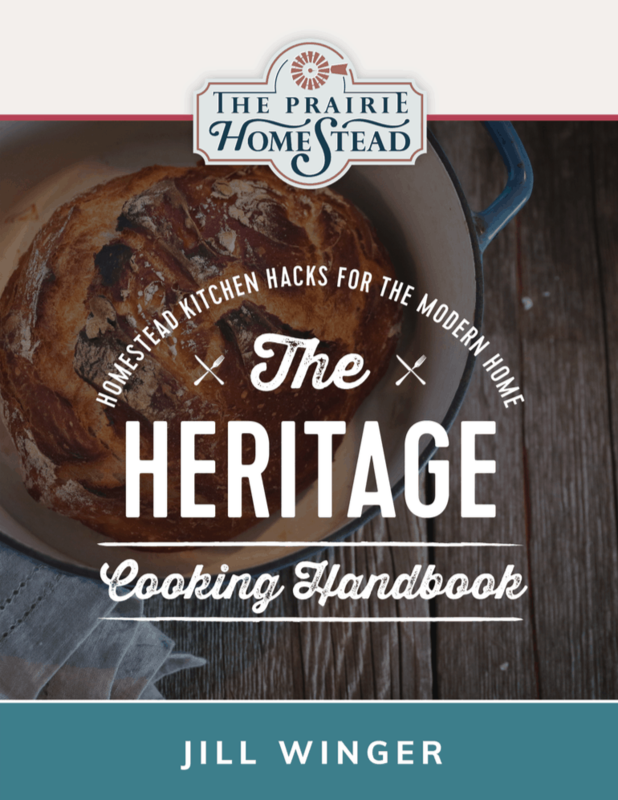 I even sent a copy of the pizza crust recipe to a friend in Illinois who bakes all the time and she loved it. Next on the horizon is the pasta and the cheeseburger soup. Thanks for all the great recipes!!! When you cook the fettucini noodles must they be done in small batches so they don’t stick together? Or is adding oil to the water necessary? I made a batch of fettucini and had a problem with them clumping together. Also… How dry should they be? 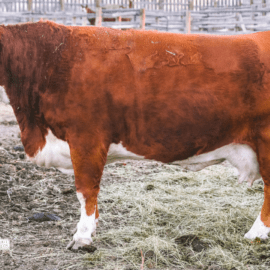 Leather-like… Not brittle? Thanks for your help and inspiration! Jill should they also be very dry before I cook them (right after I make fresh noodles)? You shouldn’t ever add oil to pasta cooking water. That’s generally a big Italian pasta no no. The same process that keeps them from sticking together prevents the sauce from clinging properly to the noodle. If you flour your noodles very well and have the water at a rolling boil they shouldn’t stick. Also, make sure you’re using a big enough pot. I threw in all my noodles when i cooked my noodles and surprisingly they didn’t clump. But i also added salt and a touch of margarine (for the oil) to my water and periodically sturred. Does fresh pasta freeze well? I’d love to make a whole lot at once then stick it in the deep freeze for later. Yup! You can definitely freeze it. I agree. Simple is easier and often superior, tastier and healthier. How long do you boil it once it’s dried or frozen? Made this yesterday with 00 flour. It was good but not as tender as the pasta I had in Italy in September. Made all by hand so I will give it another try with the Kitchen aid. I needed a lot more moisture, added in splashes while kneading, but dough was nice and soft and quite easy to roll out by hand. Used my new pasta cutting rolling pin to cut, dried, lightly floured on a dish towel, 1 hrs, no sticking when I cooked. Recommend this. I got to this link through your tutorial on Butternut Alfredo Sauce (can’t wait to try it!). I do have a pasta machine, but wondered if you make the shells (as shown in the photos) and if so, how? Those are just storebought. 😉 I was lazy for this photo shoot. This was excellent! I followed the recipe, rolled it out by hand, and it was delicious! Can you let the dough sit for more than 45 minutes??? Thx, ? Only made it twice, once with egg, very good, and one without egg which turned out gooey. Will give it another shot but was wondering if the dough could be frozen before rolling out if I want to make multiple batches and save. Yes, you should be able to freeze the dough. Some years ago, a friend gave me an electric pasta “extruder” machine. It didn’t take long to burn out the motor. 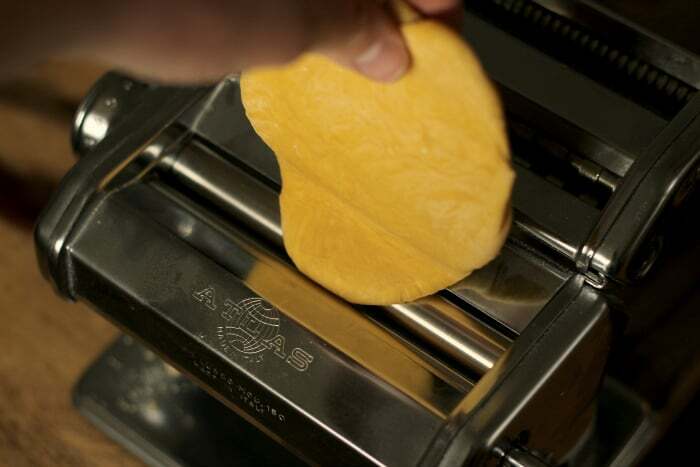 I’ve had an Atlas pasta machine for over 30 years. It works perfectly. It works even more perfectly when I’m not in a hurry and allow the pasta dough to rest about an hour. Thanks for the refresher course! It’s been a while since I made pasta, but it all came back to me after looking at your recipe. My mom never bought pasta, and never used a machine to cut what she made. Not sure if I’m that good with the rolling pin. However, she’d continuously fold each side of the rolled pasta toward the center until it looked like a scroll. Then she cut it by whatever width she wanted. Finally, she’d scoot a wooden spoon under the center and lift. Voila! Pasta would unroll. She would then take a broomstick, place it between two chairs, and hang the pasta to dry. Having company? Her rule of thumb was one egg per person. Add flour accordingly, or make more to freeze! Man, she was a master cook. Wish I watched her more when growing up! This is awesome! Thanks for sharing Maria! Durum wheat not only gives the perfect texture for noodle dough, but the yellow color (along with farm eggs) makes them look exquisite as well. Caution to those who use whole wheat and dry the noodles to store them. Whole wheat noodles don’t last as long as dried because the oil begins to go rancid. My first try at making homemade pasta and this recipe was perfect. So easy to follow and the fettucine noodles I made were delicious! 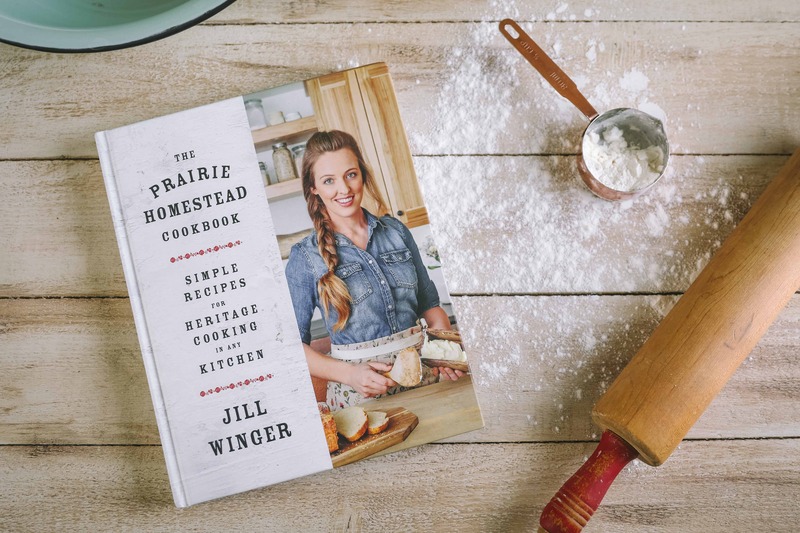 Thank you Jill for such a great recipe! It’s a keeper! So glad you liked it, Jane! I also forgot to mention…. your recipe is great for pierogi’s too. Less flouring, but same concept. Oh yum! I haven’t tried that– great idea! I love this recipe. People expect store quality when it comes to homemade. They don’t understand there is a difference! This recipe is so easy and tastes like REAL homemade pasta. The key is, like you stated, always flour! I don’t just sprinkle, i rub flour into the dough. It gives it a rough like texture and the dough doesn’t stick. I also found a pizza cutter is easiest to cut if you don’t have a pasta machine. Of course, it takes a few tries to get it consistent, but practice and patience does the job. I am in a catagorie all by myself in my area because I like to make my own stuff. From pasta to soap to socks. And everything in between. I am so glad to see homemade is still alive. Keep up the good work. Your noodle recipe is the exact one I have used for 45 years. So which pasta maker do you use? 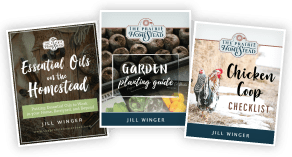 I looked on Amazon and holy cow, there’s a lot of them ranging in prices to cheap to very expensive……..I didn’t get the affiliate link to work for me…….thanks…..
We enjoyed this easy recipe! Did half and half semolina and all purpose flour. Rolled out with a rolling pin and used a pizza cutter. Super easy and delicious! Thanks! It worked! I’m not a cooking whiz, but this one was so easy. The family loved it. I just made them, and served them that night. Thank you for making it simple. I had bought a machine years ago, and was ready to pass it on, but I saw your post just in time. I’ll never buy ready made again! I use oo flour and use a KitchenAide for the mixing/kneading. About 8-10 short pulses on the machine ( it will come together in a ball). A couple of gentle kneads and form it into a ball, cover with plastic wrap and rest. Great tesults every time, minimum effort. Before I try this I’m just wondering, can you make ravioli with this recipe? I just got some pasta machines and I would like to make some. i was looking for the same question here. I am making ravioli tonight and would like to use this recipe as it worked great for regular pasta. Just never made ravioli and don’t know if the recipe needs tweaking? Never mind I am going to make fettuccine pasta but thanks anyway! I am definitely going to make this. The reviews are awesome and it sounds delicious! This pasta is awesome! My whole family loved it, but I just needed to boil it a little bit more. I first boiled it for 4 minutes but it was still a little bit hard so I did it again for about 2-3 more minutes. Also, if you’re wondering where you can buy a pasta maker, you can buy the CucinaPro on Amazon. Thank you so much for this recipe. I am going to make this all the time! I want to try this for my pasta-loving kids!! Which pasta maker is your favorite? 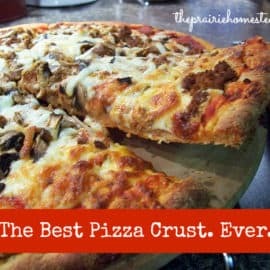 Would you recommend this recipie with a kitchen aid mixer using the dough hook? Sometimes I read the comments just to “listen” to the conversation. Jill, you and your family are a blessing, and your commentors are also! Been making my own pasta for years now. It takes more time but it is totally worth it! My fiance and I try to make fresh pasta dishes at least once a week. Ok I wasn’t paying attention. Did 3 eggs 2cups flour 1/2 tsp salt. We a bit dry then reread receip and noticed said 1 til olive oil. I put some in after kneeding and kneeled again. Will this turn out right? This made a nice amount of pasta! I did half fettuccine and half angel hair just to play with my pasta roller. I’m going to make some from fresh and dry the rest, how do you recommend storing the dried pasta? Thanks for a great recipe! I love you!!! I’ve never done this before and it came out awesome! would have been a little easier had i had a rolling machine, but i managed with a rolling pin, paring knife, and my sore hands!!! First time I made fresh pasta I was told to use 00 flour. That stuff is expensive for a little bag. Then I saw this recipe and gave it a try. I made fettuccine Alfredo, and it was fantastic. It was very easy. If I say it’s good, IT’S GOOD! I’m a big food critic, especially towards my own cooking. I will use this recipe for future pasta making. Can I freeze pasta dough if I wanted to make ahead or in bulk? I see your machine is an Atlas. I just ordered one and I see the UPS man just delivered it to my door. Now I want to leave work and go play with it! Thanks for the recipe and tips! I have made this pasta twice before and it came out perfectly each time! It’s so easy and tastes great- way better than store-bought pasta. Everybody should try this recipe! Just one question: Can I use whole-wheat flour to make this healthier? P.S. If I could, I would give this recipe 10 stars! This is awesome can’t wait to try it this weekend!!! One tried with other recipe and never success. Hoping this is will work for me. All I have is the Kitchenaid stand mixer pasta extruded. Does the rolling part need to be done? Because I don’t have any rolling attachment. Jill, what pasta machine do you recommend? If I made a bunch of pasta what is the best way to store it if I am not freezing it. How long will it last being stored as a dry good in the pantry. 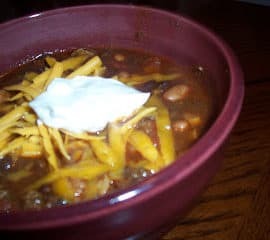 I made this recipe and chronicled my first time on my blog! It turned out so good! 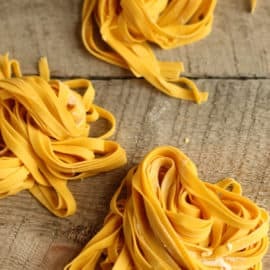 https://zirahchilds.wordpress.com/2018/08/03/challenge-accepted-handrolled-pasta/ If you want to check it out! Thanks for the recipe!! I love to cook and bake, and I’m only 13. I wanted to try making pasta because I saw it in a recipe book once. I had so much fun making it and using the pasta machine, and it tasted delicious. Would totally make it again! Can this recipe be used to make ravioli? She put a broom handle across two chair’s with a sheet under it & hung the noodles to dry that way,so if they broke as they dried they would still be clean on the sheet. I also learned that the rest period is the secret to good noodle or perogy dough,she told me make my dough nite before let rest in a cool place(frig)then make them next day. I was so blessed to have such a dear friend ,who taught me so much.